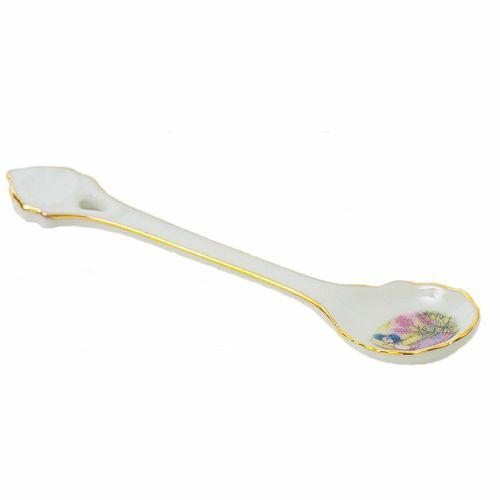 From the Reutter Porzellan Jemima Puddle-duck 100th Anniversary collection - A delicate porcelain spoon with a very uniquely shaped handle, featuring a beautiful illustration of Jemima Puddle-duck in the garden. Reutter Porzellan have been manufacturing their estimable collections in their own production facility for over 50 years. Their porcelain miniatures are exquisitely detailed and unique throughout the whole of Germany. During production, articles may pass through the hands of as many as 17 skilled craftspeople as they are cast, glazed, painted and subsequently fired up to three times in order to produce the distinctive Reutter appearance that has made the company universally popular.